The Facepunch Forums Upgrades system allowed users to purchase perks for their account. 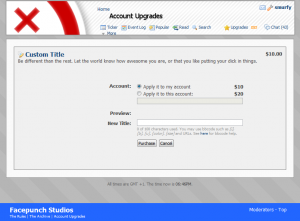 The system offered custom user titles, Gold Membership and username changing as upgrades. The original 2011 upgrades system. 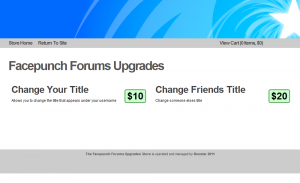 The first account upgrade available on Facepunch was Gold Membership, which was available for $10 until February 2006. The first incarnation of the modern upgrades system was launched on January 15, 2011, allowing users to buy custom user titles from a special page within vBulletin. This was taken offline a few months later, but garry said upgrades would make a return shortly. Upgrades were re-introduced on July 2, 2011, using the new external "Boostar" system which garry designed. This new system allowed users to choose how their payment would be distributed among Facepunch mods. On July 5, Gold Membership became a purchasable upgrade for the first time in five years. garry briefly added username changing for $20, before taking Upgrades offline "for a few months" on July 21, refusing to say why. In 2013 and 2014, some of Boostar's individual upgrades were disabled periodically partially, due to costing Garry more than he was earning from it, possibly in taxes. However, as this wasn't disclosed at the time, rumors began circulating that it was connected to garry having made the Rust section of the forums public. Rumors also circulated that buying the Gold Member upgrade would get you a beta key (which is not far from the truth, as garry had made a thread in the Gold Members Forum where he gave away keys),  resulting in many new members joining, buying Gold, and posting in the GMF asking when their key would arrive. Other users changed their title to garry's name after seeing new members mistake titles for usernames. garry circumvented this by first censoring the word "garry" in titles, and later disabling the purchase altogether. On August 2014, the only purchasable upgrade was a $5 self-title change. Somewhere around early 2015, the upgrade system got entirely removed. The Facepunch Community Fund was a spiritual successor to the old Upgrades, as it offers the ability to purchase user titles and Gold Membership. The New Sites Forum's coin-based Shop is another spiritual successor, initially offering the ability to increase the max width and height of one's avatar (from 65 for both, to 180), with Newpunch 3 introducing the ability to purchase Gold Membership, set an avatar background and change one's username.